It is my pleasure to introduce myself. 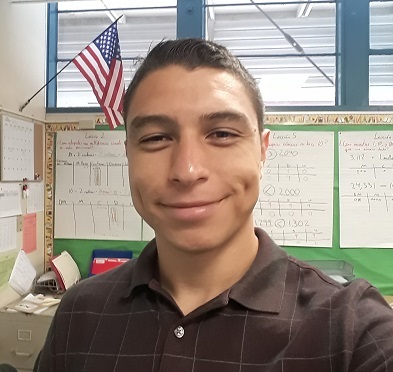 My name is Josue Palacios and I am very happy to be part of the 4th grade team here at Mt. View Elementary. This is my 4th year as a school teacher, and my 3rd year in this grade level. I have previously taught 5th grade and completed my student teaching in 2nd and 3rd grade. I have a Bachelor of Arts degree in psychology from the University of California Riverside and I graduated high school in Temecula Valley. Apart from teaching, I am also a boxing coach for Raincross Boxing Academy here in Riverside. A quote that I apply to both boxing and education is “strive for progression not perfection.” My goal is to embed this into the minds of my students to teach them that it is alright to make mistakes. I promote a growth mindset in my classroom and emphasize the importance of making mistakes, and to learn from them. I am also a husband and a father, so I understand the full view of education and know how important it is. What motivates me about teaching and coaching alike is being able to witness learning take place. Watching students achieve something they did not previously know how to do is what motivated me to pursue this career. Helping out in that process is extremely rewarding to me and is the reason why I am in education. I am very excited to start this 2018-2019 school year and work alongside the 4th grade team to make this the best year ever."